Join a band of ghostly bandits in the American wild west in Polterheist. This 5 reel, 100 payline video slot comes from NextGen Gaming and you’ll find plenty of extra wilds, transforming ghost symbols and best of all, free spins round where all payouts receive a 2x, 3x or 5x multiplier boost. Play this highly volatile game on all devices from between 50p and £125 per spin. Polterheist looks and sounds terrific. The setting is a wooden shack. The reels are made up of fluorescent A to 10 symbols and quintet of Wild West style ghosts. The best of gang is Goldie Goldrush who awards up to 20 times your bet if you land 5 in combination. There’s also a wild, the wanted poster, which substitutes for everything apart from the scatter. There are 3 extras on offer in Polterheist. Haunted Wilds feature – when this is randomly awarded, extra wilds are added to reels 2, 3 and 4. Ghost Break-In feature – when this becomes active, 1 of the ghostly gang members is selected at random. You’ll see extra stacks of this symbol spinning around the reels. Any other ghost symbols that land on this spin morph into the specially chose ghost too. Free Games feature – land the safe scatter on reels 1, 3 and 5 on the same spin and your reward will be 8 free spins. Look out here for the multipliers which boost payouts by 2x, 3x or even 5x throughout the round. Every time a safe symbol lands extra free spins are added to your tally. 1, 2 or 3 safe scatters deliver another 1, 5 or 8 free spins. You can hit the Haunted Wilds or the Ghost Break-In features during the free spins too. If you like your action volatile, then you won’t be disappointed with Polterheist. This is a very high variance game with payouts of 2,000 times your bet on each free spin with a 5x multiplier. Expect lengthy spells when the gang will make off with your bankroll. Get lucky with the multipliers and other extras in the Free Games feature and you could make off with plenty of loot. Side City Studios have combined 2 ever popular themes to impressive effect here. The visuals are classily done and the spaghetti western style soundtrack is a perfect fit for the theme. The features aren’t especially innovative but they have the potential to pack an explosive payout punch. 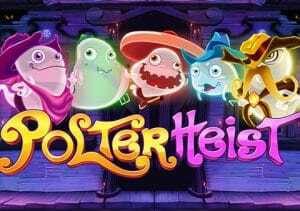 If you like volatile action or the Wild West or ghostly theme then Polterheist offers plenty of thrills. I suggest you try other NextGen Gaming collaborations with Wild Dodo a good one to play.